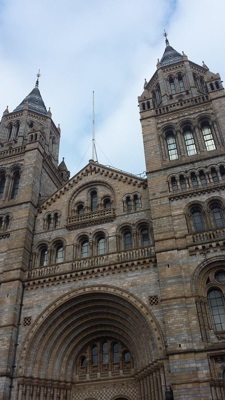 You may recall that early this year the museum made the news when they announced that "Dippy" - a plaster cast of a diplodocus skeleton - was to be moved from the Great Hall ("Hintze Hal"), and replaced with a blue whale model suspended from the ceiling. This frees up floor space, surely an important consideration in such a busy venue where crowd management is surely an issue - but somee people alleged that commercialism played a part (the extra floor spaced would allow more room for tables when the museum rents out the hall). Today's new story however concerns the addition of a new dinosaur exhibit. Apparently the museum is planning to remove their Wildlife Garden (home to some rare moths and beetles among other things) and replace it with a new "Jurassic" area.